We've already reviewed a few of Mr Neve's Portico devices in SOS, and have been impressed by the quality — but as well as offering some of the designer's distinctive sonic flavour, this unit also gives you something a bit different. There can be no better-respected name when it comes to analogue audio design than Rupert Neve. The Neve company name, of course, has changed hands more than once over the years, but Rupert himself continues to develop new designs through the Texas‑based Rupert Neve Designs. 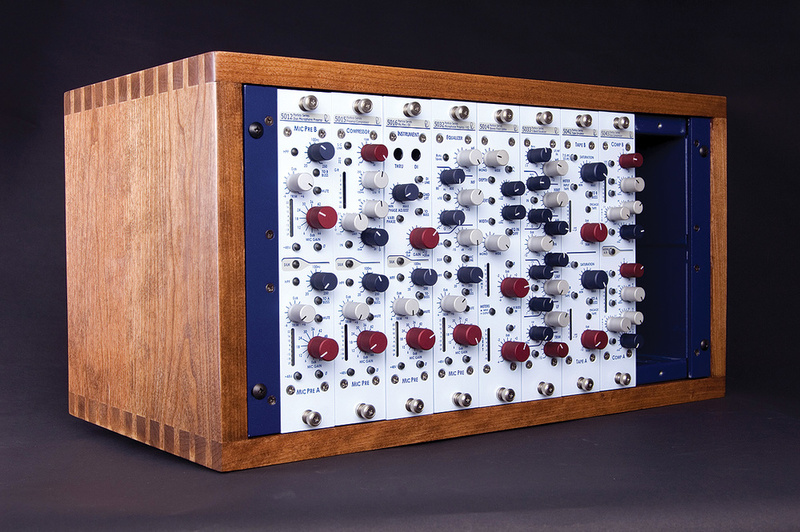 The company's Portico range quickly established itself by combining proven analogue design principles with realistic pricing, and we've already looked at a couple of units in this range (the 5012 mic preamp and 5033 EQ back in SOS April 2007, and the 5042 and 5043 dynamics processors in SOS July 2007). This time, I'm looking at one of the more unique devices in the range, the 5014 Stereo Field Editor. The 5014 Stereo Field Editor offers insert points for the side channel of an M/S stereo setup, and they're presented as separate, balanced send and return jacks. The Portico 5014 Stereo Field Editor (for editing the stereo field, not 'in the field'), applies a number of proven techniques for the manipulation of a stereo audio source, entirely in the analogue domain. Mastering engineers often split conventional audio into a mono signal plus a side (or 'difference') signal, so that they can process each independently, and the 5014 has this type of Mid/Side (M/S) processing at its heart, allied with level, width, depth and phase controls. Stereo material may be further processed using external devices such as compressors, expanders, de‑essers and equalisers, via the difference signal Insert point, for the independent processing of the Side signals prior to recombination into conventional stereo. It's even possible to add reverb to the difference signal, so that stereo sources become more ambient, while centrally panned sounds remain unaffected. The insert is only active when engaged: the balanced send jack carries the left‑right difference information only ('pre' the semi‑parametric EQ). The Return jack is transformer balanced and floating. 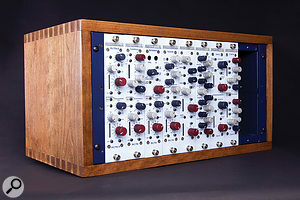 As with most other units in the Portico range, the 5014 can optionally be purchased with a panel for vertical positioning, so that units can be combined in a small rack such as that pictured above, making it easy to take advantage of the Portico bussing system.Each input has its own gain control, plus a 'phase' (polarity‑invert) button, allowing phase errors to be corrected or unbalanced stereo signals to have their balance adjusted. Once the audio has been split into 'M' and 'S' signals, the Width control can be used to adjust the balance of the two, allowing the stereo width to be adjusted, from mono to wider than the original material. This is a well‑known principle, but there's also a Depth control, which has the effect of moving the perceived stereo soundstage closer or further away. When used alongside the Width control it can adjust the apparent ambience in a recording, depending, of course, on the nature of the source material and how much stereo information it contains. More practically, a centre‑panned vocalist or soloist could be pulled forward in a mix, or reduced in level to the point of disappearing, without significantly affecting the hard‑panned stereo components of the mix. In a mastering situation, a unit such as this makes it possible to fine‑tune the vocalist's level in the track, as well as facilitating some useful stereo‑width manipulation tricks. It's no surprise to see audio transformers in the signal path, and these are used in conjunction with line amplifiers that have ±10 of gain-trim adjustment. 'Phase' inverts the polarity of the selected channel, as you'd expect, while an in‑built equaliser operating on the Side or difference signal offers a variable frequency-range of 120Hz to 2.4kHz, with ±15dB gain and a choice of two Q settings. Equalisation of the Side signal makes possible some interesting psychoacoustic treatments that change the way in which stereo width is perceived, but it also makes it possible to EQ signals that were originally panned extreme left or right without affecting the sound of anything panned to the centre. Brightening up the difference signal can add a nice gloss to a recording, for example. The main audio I/O is on balanced XLRs and the same bussing system (via jacks) is used as on the other Portico units. A pair of eight‑segment LED peak meters cater for the left and right level monitoring. As you'd expect from anything with Rupert Neve's name on it, the audio performance is exemplary, with distortion and noise components below 0.0015 percent (2kHz, +20dBu output level, unity gain). Under normal operating conditions, the noise measured at the main output is better than ‑96dBu. The unity‑gain frequency response measured at the main output is 10Hz to 100Hz, ±0.5dB, with crosstalk below 100dB at 16kHz. Whatever mystique surrounds Rupert Neve's designs, I think he'd be the first to admit that what he actually makes are tools: he just happens to make particularly good tools! Like all tools, though, they're intended to do a job, so when he adds a feature he does so because he thinks somebody may benefit from it, not because the marketing department would like to see another knob. The 5014 Stereo Field Editor is a case in point: it performs a relatively simple task, but does so up to the standards expected by a mastering engineer — and while it may not be an obvious box for the project‑studio owner to buy, if you plan to do your own mastering in the analogue domain, you'll probably come to rely on it. Having EQ in the difference signal is extremely useful, as is the Depth control, because both allow you to control the apparent ambience in the recording, in a subtle but musically useful way that can be used to draw attention towards or away from the main instrument or vocal. It isn't just about the tools, though, because the 5014 also has the apparent ability to make digitally originated signals sound sweeter and more solid, again probably due to the use of audio transformers. Being picky, I would really like to have seen a Mid-signal insert point, as well as the one on the Side signal, because sometimes it's desirable to add more compression to mid‑panned vocals without affecting the stereo field — although, having said that, there's a limit to what can realistically be included at this price point. The 5014 Stereo Field Editor is really a specialised device, and will be of most use to those doing their own mastering in the analogue domain. However, that doesn't detract at all from what's an excellent product. This processor aligns itself with the other Portico models in its technical performance, and in the provision of practical and useful features, not least the bussing system that allows multiple modules to be connected as a simple mixer. It also seems to capture that solid and immediate character for which Rupert Neve's designs are best known. This is pretty much in a class of its own: I really can't think of an obvious hardware alternative to the 5014 Stereo Field Editor at this price point. Sensibly priced, given the design and build quality. Great sound quality, with a hint of musical flattery. I can't think of anything I didn't like... other than having to give it back! This module perfectly complements the rest of the Portico Range, and incorporates traditional high‑end analogue design values. Portico 5014 £1295. Prices include VAT. Sonic Distribution +44 (0)845 500 2 500. Rupert Neve Designs +1 512 847 3013.